edited by Gerard V. Bradley. Cambridge, UK: Cambridge University Press, 2012. 230pp. Cloth: $95.00. ISBN: 9781107012448. 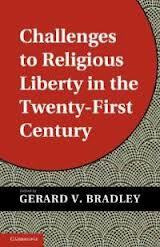 This recent book, edited by Professor Gerard V. Bradley at the University of Notre Dame Law School, is a collection of diverse essays that explore current and anticipated challenges to religious liberty in the United States and globally. The essays stem from a conference convened by the Witherspoon Institute at Princeton University in 2009, and offer a “serious engagement with new ideas, creative thinking about emerging practical problems, and a critical reappropriation of philosophical foundations” as a means to discussing religious liberty (p.xiii). The contributions present a range of ideas and methodologies too, from varied interpretative approaches to the religious liberty clauses in the United States Constitution to philosophical, historical, and constitutional approaches to protecting freedom of conscience (what the book refers to as ‘conscience protection’), considered to be “the most urgent challenge to religious freedom in the United States today” (p.xv). In addition, a few essays pursue more political science approaches to understanding and highlighting challenges in religious freedom globally, with attention to U.S. foreign policy. Part I of the collection contains two chapters that pursue an originalist reading of the Establishment Clause of the U.S. Constitution. Each author uses a blend of interpretive, philosophical, historical, and theological approaches to analyze religious liberty in the constitutional framework. Steven D. Smith’s chapter advocates for an interpretation of the clause that prevents government from exercising power over the church as an institution, instead of just limiting government power over religious belief and practices. For Smith, the clause allocates jurisdiction between “the polity that was ‘the church’ and the polity we call ‘the state’” (p.17). The next chapter by Gerard Bradley offers an interpretation of the clause complementary to Smith’s. Bradley uses opinions on church-state law in which Justice John Paul Stevens takes issue with an originalist reading of the religious liberty clauses. For Stevens, the founders understood the young United States to be Christian nation, therefore the religious liberty clauses protect Christianity (and by historical implication certain Protestant sects). For Stevens, then, an originalist reading of the First Amendment must recognize that some religious were originally excluded from its protection. Bradley argues, though, that even though the founders may have trusted the veracity of the Christian faith, they did not view it as the sole faith protected by the Constitution. They meant to include non-Christian faiths too such as Judaism and Islam within their understanding of religion in the Constitution. An originalist reading of the Constitution in [*51] Bradley’s view is more tolerant of religious diversity than some would allow, and indeed, as he suggests further, the Constitution’s religious liberty clauses are best understood through an “incompetence principle,” which holds that “the truth of certain religious propositions (but not others) must never be part of a law’s justification”(p.42). Part II of the book addresses related concerns about law and religion, but instead of focusing on the original meaning of constitutional provisions the chapters study the relationships between the government and non-governmental religious entities. Kent Greenawalt regards how government reacts to claims of coercion by religious groups, and he focuses his analysis not on constitutional concerns but instead on how private, civil law can respond to issues of coercion of individuals by religious groups. Using varied examples from the disclosure to a congregation of the private life of a parishioner by church elders and shunning (the isolation of a congregation’s member) to the get, or religious divorce in Jewish law, Greenawalt shows how complicated it is for the government to counteract a religious group’s coercion of an individual within its fold. Scholars of law and religion will find his analysis very interesting since it covers relationships between law and religion that are not often studied. The second essay in Part II by Richard W. Garnett assesses the role that religious institutions should play in our understanding of religious freedom and church-state relations. For Garnett, religious institutions are important mediating institutions in society and are more than just “voluntary associations with a cause” (p.78). Further, our understanding of the separation of church and state should reflect the mediating role that they serve: “well understood, separation of church and state denotes a structural arrangement involving institutions, a constitutional order in which the institutions of religion . . . are distinct from, other than, and meaningfully independent of the institutions of government”(p.79). Thus, an institutional reading of the religious liberty clauses would protect and reinvigorate our understanding of independent religious institutions as important to checking government power. Part III of the book devotes attention to the issue of freedom of conscience and questions concerning how the law can best protect that freedom. Christopher Wolfe suggests that instead of protecting religious conscience through court created and enforced constitutional standards applicable to other government agencies, in some cases legislators and others can “internalize constitutional principles and integrate them into their prudential judgments” about law and policy (p.99). Wolfe provides a framework to guide the “prudential judgments” of government actors, and ultimately suggests a principle of “forbearance” through which policymakers faced with conflicts over the establishment and free exercise clauses religious conscience would be sensitive to the different beliefs and practices of religious minorities. This sensitivity, for Wolfe, “would make public officials (and citizens in general) more likely to try to accommodate religious beliefs in cases not involving very important obligations of the community” (p.110). The subsequent [*52] essay in this section by Christopher Tollefsen articulates a philosophical framework based on Thomistic reasoning for determining when religious conscience should be protected from state interference. Tollefsen applies his framework to specific policy areas, especially those concerning health care related issues. The final two sections of the book highlight issues central to religious liberty in a global context. Part IV considers how the forces of globalization pose unique challenges to religious liberty, and Part V discusses U.S. foreign policy and the importance of promoting religious liberty abroad, and indeed the moral responsibility to do so. As regards religious liberty and globalization Jose Casanova argues in his essay that the “truly novel aspect” of globalization presently is the fact that religions are “deterritorialized global imagined communities, detached from the civilizational settings in which they have been traditionally embedded” (p.140). Linked with that is a “growing global trend of mutual recognition of cultures,” an awareness that allows for balancing between an individual right to religious freedom that encapsulates a right to proselytize, with a communal right to protect and preserve a culture. Indeed, Casanova crafts an argument for cultural sensitivity to the conflict between an individualistic right to the free exercise of religion versus the religious rights of a collective religious culture. To that end, the essay charts the positive development of a “truly respectful religious freedom” that is evolving into a universal aspiration that affects many of the world’s religions. William Inboden’s following chapter continues the discussion of religion and globalization and analyzes how globalization broadly understood “affects the specific and universal good of religious liberty” (p.154). Inboden explores various links between economic globalism and support for religious liberty and how other forces of globalization, from technological advancement to cultural nationalism, affect support for, or repression of, religious liberty. Part V of the book continues the exploration of the links between religious liberty and global forces with a specific look at U.S. foreign policy. Daniel Philpott’s chapter analyzes the links between religious freedom and national security as regards foreign policy, and presents a compelling argument that furthering the cause of religious liberty globally will complement the overriding policy goal of guarding against terrorism. Indeed, in Philpott’s analysis American policy towards other regimes often prioritizes national security and anti-terrorism over human rights (including religious liberty), and this need not be the case. Philpott defines an empirical framework for understanding the differences as to why some religious organizations and their leadership pursue violence and terrorism, whereas others support democracy, in order to show that America’s foreign policy objectives of reducing terrorism can be achieved by promoting democratic regimes that protect religious freedom. For Philpott this should be a guiding objective of American policy towards the Islamic world. Thomas Farr’s normative essay on the moral responsibility of the United States to promote religious liberty worldwide follows and balances Philpott’s more empirical analysis. For Farr, [*53] the U.S. has a moral obligation to promote religious liberty for two main reasons. First, “it is a moral good to defend human dignity and justice through the advancement of international religious liberty,” and second, promoting religious liberty helps the U.S. protect its own interests (p.195). Farr’s second reason – protecting American interests – is more prudential than the first, but he makes a compelling argument that by promoting global religious freedom the U.S. will help foster civil society and stable democracy in countries that tend to nourish extremism and terrorism. Challenges to Religious Liberty is a very interesting book. The diversity of essays range across many different approaches to understanding some of the current and future challenges that religious freedom faces, not only in the United States but also globally. One common theme of the essays, to a varying degree, seems to be a focus on religious institutions, instead of a focus on specific faiths or religious movements. Accordingly, many of the authors contemplate the legal, constitutional, and policy roles of churches, for example, more so than faiths or belief systems and in the process reinvigorate a much needed dimension to how we understand the development of church-state relations. Scholars of law and religion, and religion and politics, will find the book very interesting for the variety of the approaches to studying and understanding the topic, and for some of the reassessments of current law and policy that the authors provide. Scholars who study the global dimensions of religion, and international politics and religion, should certainly take a look at the essays on globalization towards the end of the book too. The book is appropriate for advanced undergraduate and graduate level courses in law and religion, religion and politics, or similar courses. Copyright 2013 by the author, John C. Blakeman.